Jake Allen has sat out the last three games. 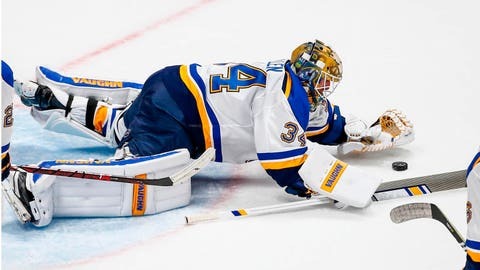 Jake Allen will be in goal when the St. Louis Blues open a three-game road trip Wednesday night at Chicago. Allen has sat out the last three games while Chad Johnson started. Johnson won two of those games, including a shutout of San Jose on Friday. Allen is 4-3-3 with a 3.99 goals-against average and .879 save percentage in 11 starts this season. Coach Mike Yeo announced Tuesday that center Brayden Schenn would miss his third consecutive game with an upper-body injury. Forward Nikita Soshnikov and defenseman Jordan Schmaltz will be St. Louis’ other scratches.